I’d heard that mice were fragile creatures. 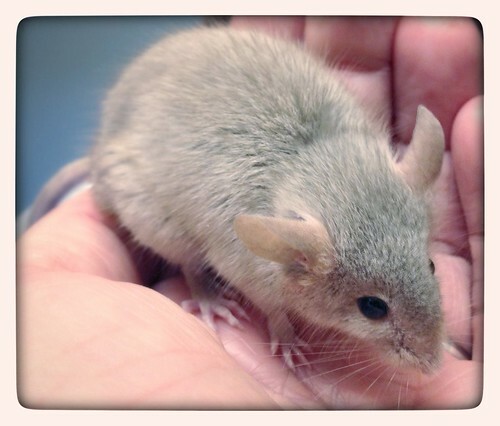 I did my research before deciding to adopt, bracing myself for the reality that even healthy mice only lived three years on average and they were particularly susceptible to infections and respiratory problems. Back in college, I’d had a pair of rats (Gossamer and Mud) who’d enjoyed a happy, healthy three+ years with me before first one, then the other, succumbed to cancer. Mud was the first to pass away, his final moments racked by painful seizures that caused him to clench his teeth deep into my finger. I still have the scar. So when the vet told us that Shou’s diagnosis was very worrying and that she might not make it through the weekend, I faced the incredibly hard decision to spare her any unnecessary suffering. I have always felt that, as a pet owner, I have the solemn and important responsibility to make the choices that are best for my animal companions, even if that choice isn’t the easy one to make. Still, I had no idea how hard it would be. Though I had lived through the deaths of a few family pets as a kid, this was the first time that the responsibility fell entirely on me. I had to make the call. I know that in such situations there isn’t necessarily a wrong or a right answer. As I watched the vet carefully handling Shou, whose tiny body shook as she struggled to breathe, I rebelled against the possibility that I might have to say goodbye. I felt a heavy sense of guilt, sure that I must have done something wrong for Shou to have gotten so sick so quickly. A big part of me wanted to insist on medication and pain killers, wanted to fight like hell to keep her alive. If I could just do the right thing now — I thought — if I could only give her enough love and attention and care, then maybe I could make up for whatever failures or mistakes I’d made in the past… if I could only will her back to health. But as the vet left us alone for a few minutes to talk over our decision, Shou weakly stretched towards my hand where it rested on the edge of her travel carrier. I lowered it towards her, and she climbed into my palm where she curled up, nestled softly against my skin. I knew then that Shou was saying goodbye. I was going to have to grapple with my guilt and my grief on my own terms. I couldn’t ask Shou to struggle through another day just so I could feel reassured that I’d done everything I could. And so, we let Shou go. I spent a lot of the rest of the day crying, and trying not to cry, and feeling guilty that I wasn’t crying more. Over dinner, my husband Jeff and our dear friend Leah indulged me while I talked about my discomfort and confusion about death, my memories of losing past pets and other (human) friends and family members. I talked about my embarrassment that my thoughts were all about me and how I was feeling, and how I felt weirdly, irrationally ashamed for caring about things like whether or not we should scatter Shou’s ashes or put her tiny urn on display. I don’t think I’m very good at handling this kind of grief, but maybe none of us are good at it. Maybe we’re not supposed to be. Death doesn’t make a lot of sense. Loved ones persist in our memories as if they haven’t really left, only gone away somewhere for a while where the post office doesn’t deliver and nobody can get a phone signal. And yet… we know that’s not true. We feel the permanency of death like a creeping loss that seems to strengthen even as the wound heals. And the wound itself, like the awful anticipation of some slow-blossoming absence that we feel all at once, only seems to ease if we let ourselves live into that absence as fully and openly as we can. Or maybe it’s nothing like that at all. Maybe we shouldn’t be too quick to pride ourselves on being the only animals to understand death and to know that we will die. I’m not even sure that we do, or that we are. In any case, I don’t think we choose to live in a world surrounded by lives more temporary than our own. I think the only choice we really face is whether or not we are willing to be honest with ourselves about how fragile and temporary all of life really is, and whether or not we honor our stubborn, foolhardy, roaring refusal to acquiesce to loss when it inevitably comes. Today, a card arrived in the mail from the folks at Phinney Ridge Animal Hospital (who have been so wonderfully kind and supportive and understanding). Inside was the quote from Irving Townsend that appears at the beginning of this post. On the front was a beautiful watercolor of a little gray mouse and a tiny ink paw print from our dear Shou. I placed the card on the shelf above the tank where her two sisters live. I like to think that she’ll always remain the cheerful, bossy Big Sis, keeping a watchful eye on them, and on me.